Wow where is this month going it's flying past. Well I made this card for my husband for Valentine's Day so this was my 1st card I made coming back into crafting. I used a blue pearlised card A3 size and cut it down it 8x8 size. Black card for matting and layering. I got the decoupage and backing paper from the bebunni love cd rom this is my fave at the moment lol. The roses, peel offs and gems are from my stash. 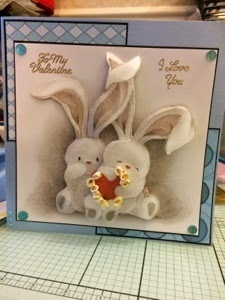 A wonderful Valentine's card, the bunnies really jump off the card - love it! Those bunnies are so cute! Great Valentines card. This may be the sweetest card I have ever seen !